In the wake of the tragic sinking of the amphibious passenger vessel, MISS MAJESTIC, near Hot Springs, Arkansas on May 1, 1999, the National Transportation Safety Board (NTSB) commenced an investigation and contracted JMS to conduct an in depth damage stability analysis. Amphibious passenger vessels have become a popular tourist attraction and carry more than 1 million passengers a year. There are approximately 30 companies operating over 250 amphibious vessels throughout the U.S. The majority of these vessels are DUKW’s which are WWII vintage amphibious vehicles 31 feet in length and capable of carrying up to 33 passengers. They were originally built for the U.S. military as an amphibious logistic support vehicle. Due to a lack of documentation in existence, JMS conducted a survey of the MISS MAJESTIC and performed an inclining experiment aboard a sister vessel in Hot Springs. 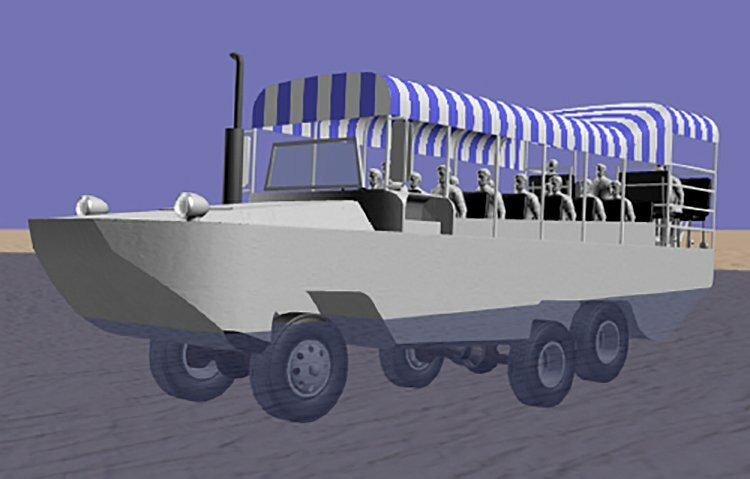 The data was used to develop a HECSALV computer model of the DUKW and perform flooding analyses for various loading arrangements. The effects of adding watertight bulkheads and buoyant foam were analyzed as possible means of increasing vessel survivability. JMS also created a computer simulation to visually depict the sinking of the MISS MAJESTIC consistent with the engineering analysis. The video demonstrated the source of the flooding and the progression of water in real time. To ensure the highest level of accuracy, the simulation was created using in-house personnel who were involved in all phases of the project including the on site measurement, inclining experiment and engineering analyses. The results of the study were presented at a NTSB public forum on “Amphibious Passenger Vessel Safety” held in Memphis, Tennessee on December 8, 1999. JMS president, Jack Ringelberg participated as an expert panelist where he discussed the findings and presented the computer simulation. The Safety Board hosted the event to provide an opportunity for the U.S. Coast Guard, State governments, amphibious passenger vessel operators, and the general public to explore safety issues relating to the design, regulation, maintenance, and operation of these unique vessels. NTSB released their safety recommendations in February 2000. Subsequent to the NTSB public forum JMS has offered its services to other commercial companies operating amphibious vessels for tourism. For example, Boston Duck Tours has hired JMS to design the overhaul of their 17 boats, which operate in Boston Harbor, MA. In addition, JMS is consulting with ocean engineers about designing and building modernized amphibious passenger vessels that meet all U. S. Coast Guard regulations.